Fig. 3. Quantification of the specific initial activity of the AChE in the brain (light grey bras), and the skeletal muscle (dark grey bars) of zebrafish exposed to different diets during 60 days. Values are presented as mean ± standard error of mean (SEM) (n=3). *Significantly different from the control group (*p < 0.05). ¤Statistical difference as compared to the MeHg exposure condition (¤p < 0.05). In the “P. reticulata” and “C. favosus” exposure conditions fish were fed with control food supplemented with 0.5% of either the P. reticulata or the C. favosus extract. In the exposure conditions “P. reticulata+MeHg” and “C. 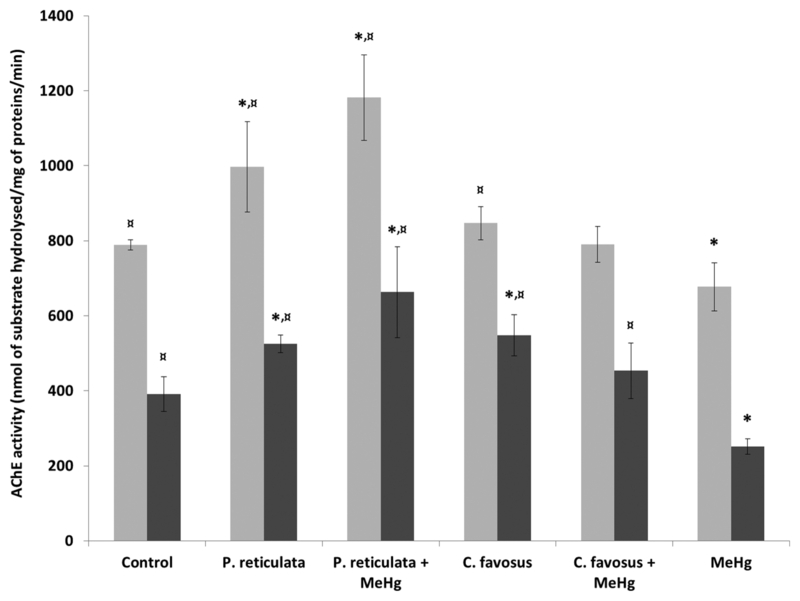 favosus +MeHg”, the food was spiked with 13.5 μg MeHg/g d.w. and supplemented with 0.5% of either the P. reticulata or the C. favosus extract. In the exposure condition called “MeHg”, fish were fed with contaminated food containing 13.5 μg MeHg/g d.w.